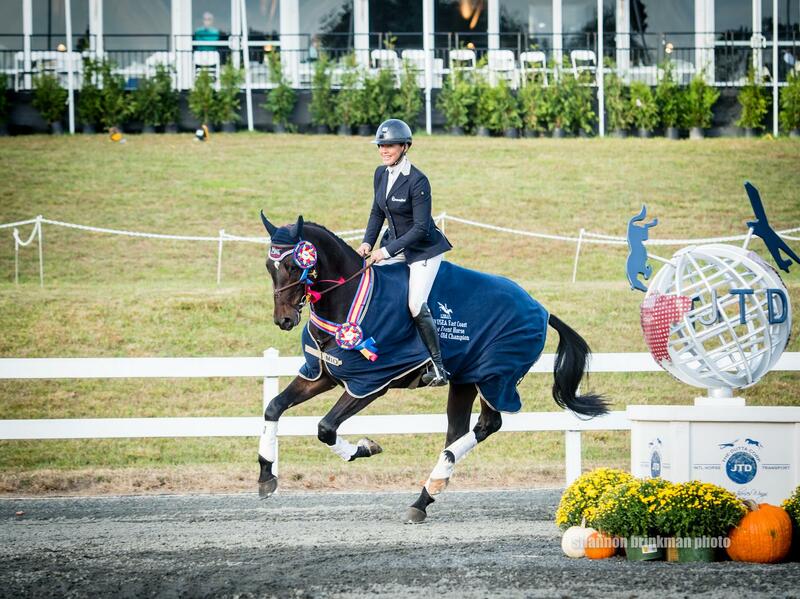 Fair Hill, MD – The West coast made sure their presence was known on Friday at the 2018 The Dutta Corp. Fair Hill International with Californians sweeping the international and young horse divisions. 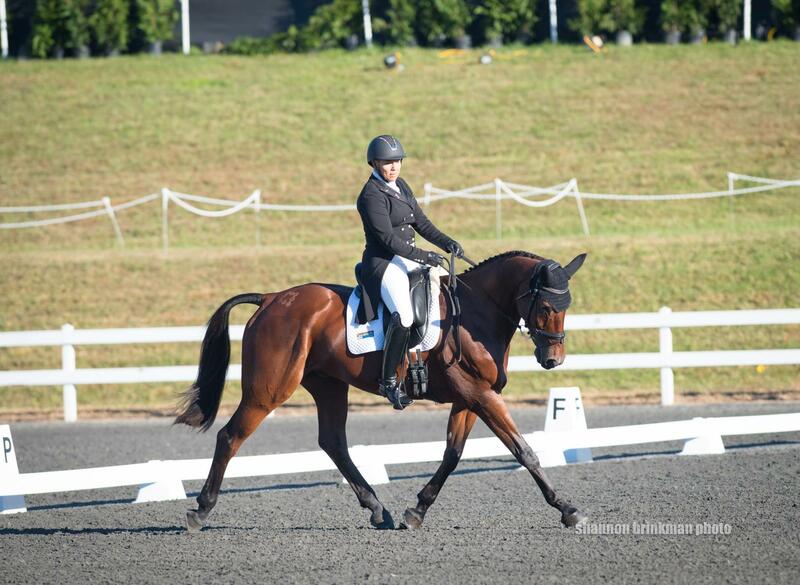 Frankie Thieriot Stutes leads The Dutta Corp./USEF CCI3* Eventing National Championship, and Heather Morris took over The Dutta Corp./USEF CCI2* Eventing National Championship after the dressage phase. Three-star winners once already this year and United States Equestrian Team (USET) Foundation Jacqueline B. Mars International Competition National Developing Rider Grant recipients, Thieriot Stutes (Occidental, Calif.) and The Chatwin Group's Chatwin, a 10-year-old Oldenburg gelding, topped Friday's leaderboard on a score of 27.3. "I feel really lucky to ride ‘Chat’ every day, and this division and the people I'm sitting next to are world-class so it feels amazing for this moment, but after I walk out of here I'm focused on tomorrow. Tomorrow is an entirely different day," said Thieriot Stutes. 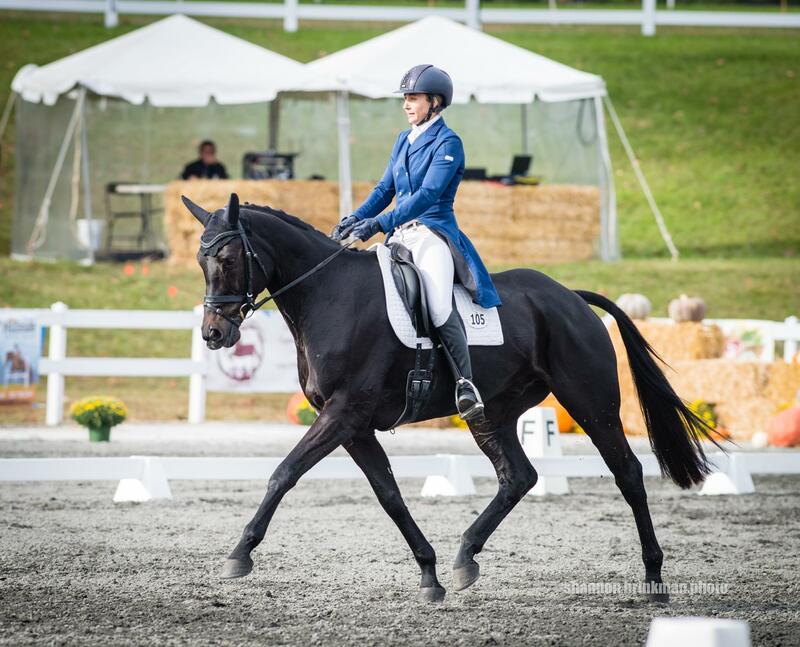 After almost a decade since her last Fair Hill International appearance, Thieriot Stutes, who is an amateur rider herself, has her former advanced horse Fric Frac Berence on her mind as she and Chatwin take on this weekend's challenge. "I hope to have a little bit of ‘Fric’ with me when I leave the box tomorrow," she said. "This is a different year, and a different horse, but I hope [Chatwin] takes care of me tomorrow as ‘Fric’ would [have]." Thieriot Stutes also currently leads the USEF Developing Rider National Championship, which is awarded to the highest-placed U.S. competitor in the CCI3* that is 18 years of age or older and who has not yet completed a CCI4* event. Caroline Martin and her own and Sherrie Martin’s Danger Mouse landed in third overall in the CCI3* and are currently second in The Dutta Corp./USEF CCI3* Eventing National Championship. Martin and the 10-year-old Dutch Warmblood gelding earned a 29 -- a personal best for this pair. The CCI2* division welcomed a new leader on day two of the dressage competition in Heather Morris (Wildomar, Calif.) and Charlie Tango, a 10-year-old Irish Sport Horse gelding owned by The Team Express Group. Their morning result of 22.9 remained untouched throughout the afternoon. "[Charlie Tango] was a really good boy today," Morris said. "He's pretty good in the atmosphere. He really excels in the canter work and we had a little bobble in the trot work so I had to make sure the canter work was perfect." U.S. Olympian Boyd Martin (Cochranville, Pa.) found himself in second place overall in the CCI2* as well as in The Dutta Corp./USEF CCI2* Eventing National Championship with Christine Turner's On Cue. The 12-year-old Selle Francais mare carries 23.7 points into Saturday's cross-country phase. Anna Loschiavo (Bradford, VT) and Melanie Loschiavo's Spartacus Q peaked at precisely the perfect moment for third place in the two-star and the national championship. The 9-year-old Hanoverian gelding sits on a score of 25.8. Jenny Caras (Cartersville, Ga.) and her own Fernhill Trendy, a seven-year-old Irish Sport Horse gelding, continue to lead the USEF Young Horse National Championship, awarded to the owner of the highest-placed U.S. horse that is six or seven years of age, on a score of 27.1 for sixth place in the CCI2* overall. Mia Farley (San Clemente, Calif.) and her BGS Firecracker, an eight-year-old Irish Sport Horse mare, sit on a score of 29.9 and lead in the USEF Young Rider National Championship, awarded in the CCI2* to highest-placed U.S. competitor who is 16 years of age to 21 years of age during the current competition year. The United States Eventing Association’s (USEA) Young Event Horse (YEH) East Coast Championships culminated Friday with the jumping and galloping portion of the competition. MB MaiStein and R River Star were crowned champions of the 5- and 4-year-old divisions, respectively. Tamra Smith (Murrieta, Calif.) was the third of the west coast contingent to best the competition at Fair Hill on Friday, as she and the MB Group LLC's MB MaiStein finished first in the five-year-old division. The Oldenburg gelding by Rocky Lee finished on an 88.29% (out of 100%), impressing the judges with his cross-country efforts that earned him 13.5% (out of 15%). "I think it's super important to support the program. The horses get the exposure without being put under a tremendous amount of pressure," Smith said of the USEA Young Event Horse Program. "The courses have always been fair, and it's interesting to get the judges point of view. I'm really excited he was a West coast horse that came to the East coast and won. I'm surprised and really excited that he did." Courtney Cooper's (Nottingham, Pa.) R River Star proved once again to be the best of the four-year-old horses Friday, winning on a final score of 83.24% (out of 100%) with Cooper riding. The Irish Sport Horse/Dutch Warmblood gelding, who was bred by the rider, is by Riverman and out of R Star. "He was great; he was light on his feet. He was thoughtful. He looked for the jumps. We started him and did all the work with him. He's really gotten down to business this last part of his four-year-old year. He's come along and really done well," Cooper said. Competitors take on the thrilling cross-country phase Saturday, October 20 beginning at 9:15 a.m. ET, and the show jumping finale will take place Sunday, October 21. This year also marks the 30th anniversary of The Dutta Corp., the event's title sponsor. The Dutta Corporation is an international and domestic horse shipping company founded by J. Tim Dutta. It has been expanding rapidly since its inception in 1988 and particularly so in the last twenty years. With state-of-the-art jet stalls and an expert team of grooms, The Dutta Corp. provides horse air transport solutions tailored to each individual horse. The CCI2* and CCI3* cross-country will be live streamed starting at 9 a.m. ET on USEF Network. Dressage and jumping will be available to watch on-demand after the completion of the event. Stay up to date on U.S. Eventing by following US Equestrian on Facebook, Twitter and Instagram and USA Eventing on Facebook. Use #USAEventing.